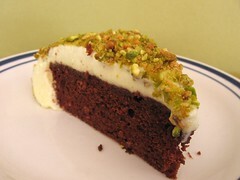 Flo Braker’s Pistachio Cake - Do You Know The Muffin Man? Notes: Instead of making the chocolate genoise, I pulled a package from my freezer labelled, “8" devil's food cake, Dec 23, 2006”, leftover from this Christmas cheesecake. There was still a lot of work to do, as the pistachios required some preparation: shelling, blanching, slipping their skins off, air drying them, toasting them in a low oven, then grinding them in the food processor. Half of the nuts went to infusing a crème anglaise used to make the pistachio Bavarian cream. Unfortunately, I didn't use the full amount of gelatin so the cream ended up like a thick pudding and the cake was difficult to unmold. It started to sag without the support of the cake tin. The Bavarian took some effort, but the flavour was quite delicate and was only supported by the ground nuts. I think a devil's food cake may be too rich for this cake, and that the genoise might have been less overwhelming. Overall, a delicious cake highlighting one of my favourite nuts.